Incineration (thermal oxidation) is one of the three options for managing wastewater solids and other organic residuals. 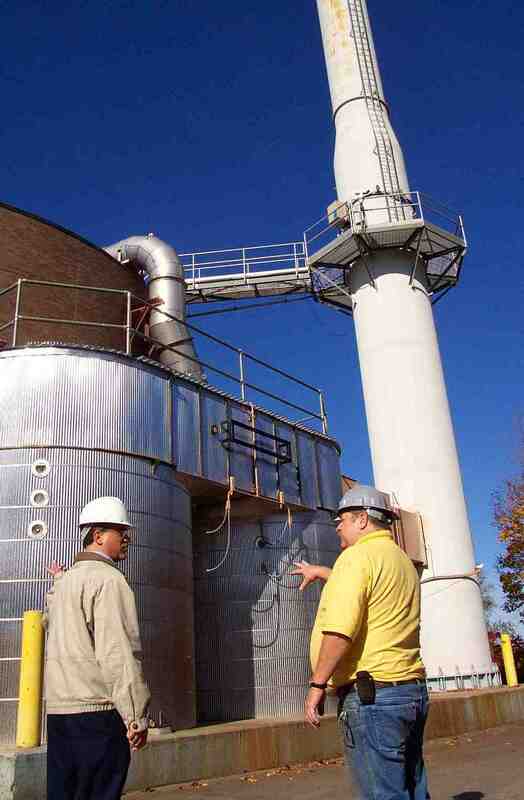 Water resource recovery facilities (WRRFs) in southern New England and some cities in Quebec rely on incineration for disposal of wastewater solids. In recent years, some incineration facilities (e.g. New Haven CT, Woonsocket RI, Hartford CT) have started capturing waste heat for generating electricity and warming processes and buildings. Pyrolysis and gasification are other forms of thermal conversion where solids are burned with little or no oxygen. In recent years, considerable research and development has advanced the possibility of cost-effective gasification of wastewater solids (sewage sludge). But, at this time, the one full-scale gasification system (Sanford, FL) is no longer operating. from NEBRA et al., 2007: A National Biosolids Quality, Regulation, End Use and Disposal Survey (available at lower left here). THESE DATA ARE OUTDATED; THERE ARE FEWER SSIs IN 2018, more like ~200 - 210. What About Biosolids Burned as an Alternative Fuel? Do the new SSI MACT standards discussed above apply to dried biosolids that are used as an alternate fuel in, for example, a cement kiln? No, probably not. As Chris Hornback of NACWA explained, “the SSI MACT requirements only apply to SSIs. If a cement kiln chooses to burn biosolids that have not been excluded from the solid waste regulation, the appropriate MACT standards for kilns burning solid waste would apply – not the SSI MACT requirements. The petition process has been used successfully… where renewable energy standards are driving interest in biosolids as a green fuel…. The petitioners were able to demonstrate that the sludge had been processed sufficiently to meet the legitimate fuel conditions. The contaminant levels remain the biggest concern, but in these cases they were able to show low enough contaminant levels to be comparable to coal and qualify as a legitimate fuel.” As an example: in 2012, Detroit received approval of their biosolids as a non-solid-waste, a legitimate fuel. Sewage sludge incinerators (SSIs), and their air emissions, have been regulated under the Clean Water Act 40 CFR Part 503 regulations since 1993. In April, 2010, U. S. EPA's Office of Air & Radiation proposed new air emissions regulations for SSIs under the Clean Air Act. After public comment, EPA responses, and amendments, the new regulations became final on March 21, 2011. In response to the new rule, the National Association of Clean Water Agencies (NACWA) and others sued EPA (see NACWA news release). In 2013, the court required EPA to review some of the rule's background information and calculations (NACWA blog). In 2015, the court denied NACWA's petition to overturn EPA's determination that incinerated sewage sludge is a solid waste. In 2015, EPA proposed moving forward with implementation of the rule as is, noting that this was part of the court's directive. At the same time, the Agency plans to review the data and calculations on which the regulation was based, as required by the court. See the full background and actions on EPA's SSI webpage. 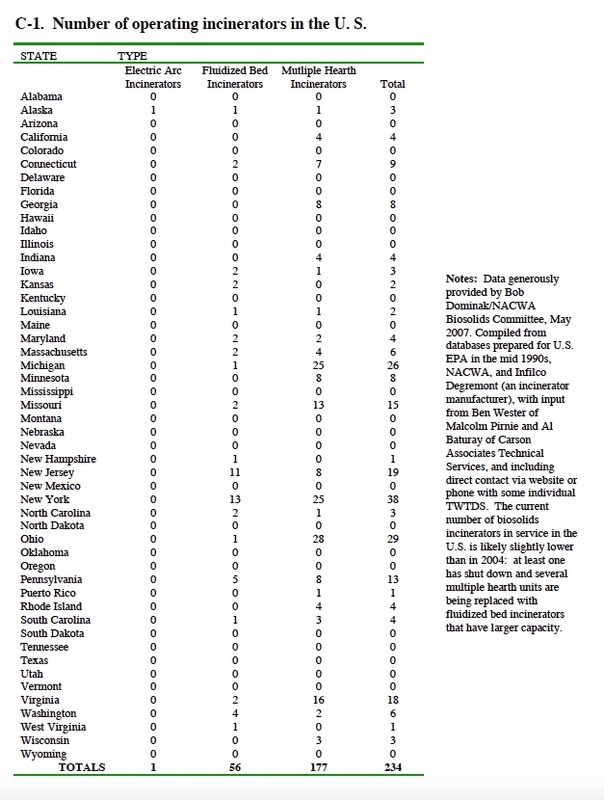 According to EPA 2010 data, there were 218 individual SSI units in 24 states across the U. S. (including one in Puerto Rico). Fifty-five of these were fluidized-bed incinerators (FBI) and the rest were multiple-hearth (MHI). 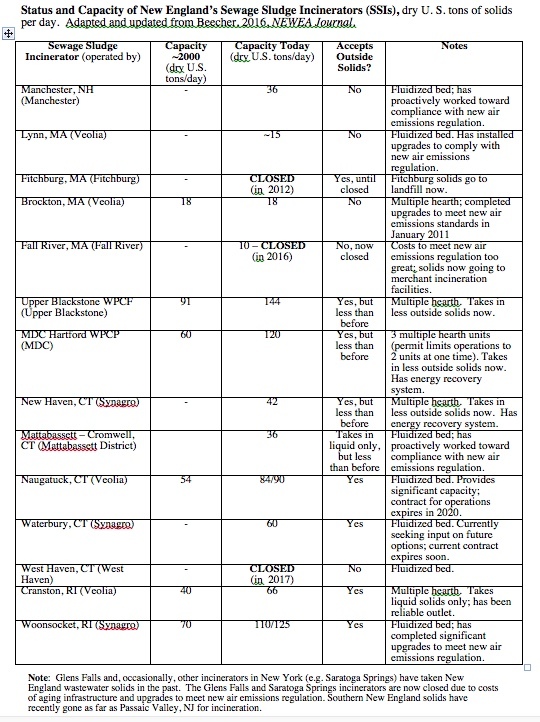 Here in New England, as of 2011, there were 15 public and private SSIs, and incineration was – and remains – the dominant form of wastewater solids management in Connecticut and Rhode Island. Since the new SSI regulations became final, at least one New England SSI - Fitchburg, MA - has decided to close down, rather than pay for expensive upgrades to the emissions control systems. Compliance with the new EPA SSI regulations is required by March, 2016. On March 21, 2011, U. S. EPA published new Clean Air Act (CAA) regulations affecting sewage sludge incinerators (SSIs). The two particular rules affecting sewage sludge incinerators (SSIs) have been the subject of great interest for more than a year. The final rules and rationale are available here. The first rule, under the Resource Conservation and Recovery Act (RCRA), was proposed in April 2010. It defines sewage sludge as non-hazardous solid waste, but only when it is combusted. According to the final rule preamble: “This RCRA solid waste definition will determine whether a combustion unit is required to meet the emissions standards for solid waste incineration units issued under section 129 of the Clean Air Act (CAA) or the emissions standards for commercial, industrial, and institutional boilers issued under section 112 of the CAA." Most significantly, EPA rejected arguments that sewage sludge can meet the legitimate fuel criterion for contaminant levels. While newer data submitted with comments indicate that, for some contaminants, sewage sludge is not that different from coal, for other contaminants there is a significant difference. “Thus, under today’s final rule, sewage sludge would not satisfy the contaminant legitimacy criterion because of the presence of noncomparable levels of metals when compared to traditional fuels,” states EPA’s discussion. Pulp and paper mill residuals are also covered by this final rule. Because of their generally lower contaminant levels, EPA believes most can meet the legitimacy criteria, and, if they are not discarded and are used at the site of generation, they can be considered non-waste fuels not subject to Section 129 standards. One last critical aspect of the final rule is the “non-waste determination petition process,” which allows generators or managers of a particular material to demonstrate to EPA that the particular material meets the fuel legitimacy criteria and is not discarded and, therefore, should be classified as a non-waste fuel. This is a significant change from the proposed rule, in which EPA was suggesting a blanket refusal to even consider any particular sewage sludge as a legitimate fuel. While some commenters argued that state regulatory programs that currently provide beneficial use determinations for energy uses of materials like sewage sludge should take precedence over the new rule, EPA states that law does not allow for that. However, EPA will gladly consider state beneficial use determinations in its non-waste determination petition process. The non-waste determination process will be run by regional EPA administrators, and “the Agency expects to develop additional guidance to assist petitioners in the implementation of the petition process.” Thus, generators of heat-dried biosolids will need to petition to demonstrate that the material, when used, for example, in a cement kiln, is a legitimate fuel. As NEBRA noted in its comments on the proposed rule, most treated biosolids meet the first two legitimacy criteria: they are handled as valuable commodities and have significant heating value. The critical concern for petitions for non-waste determinations will be whether or not the particular material’s contaminant levels are comparable to the fuel they are replacing. Although EPA is planning to conduct rule reconsiderations with regards to several parts of the current rulemaking, none of the planned reconsiderations appear to affect sewage sludge incineration. However, EPA will consider petitions for inclusion of other parts of the current rulemaking in its reconsideration process. “On February 21, 2011, the U. S. Environmental Protection Agency (EPA) finalized new source performance standards and emission guidelines for new and existing sewage sludge incineration (SSI) units,” according to an EPA news release and fact sheet. This is the SSI “MACT” rule, which was proposed on October 14, 2010. It builds on the previously-discussed rule by setting the emissions standards under CAA Section 129 that sewage sludge incinerators must now meet, because of sewage sludge now being defined as a solid waste when it is combusted. These new Maximum Achievable Control Technology (MACT) standards are now set for the four major categories of SSIs: new and existing multiple hearth and new and existing fluidized bed units. For several of the regulated pollutants, the numerical emissions limits were increased above the standards proposed in October, making it easier for SSIs to comply with the final rule as compared to the proposed rule. For example, the mercury (Hg) limit for existing multiple hearth units is now 0.28 compared to the proposed limit of 0.02 mg/dscm @ 7% O2. This revised mercury standard was the result of EPA deciding not to set beyond-the-floor emissions standards for existing multiple hearth units. Changes were also made in the data analysis and calculations for the MACT standards for other pollutants, resulting in many numerical limits that are higher and some that are lower than originally proposed. EPA considered setting separate standards for SSIs during start-up, shut-down, and malfunction periods, but argued that most units will be able to meet the new normal operating MACT standards during those periods and that long-term operations with malfunctions are unlikely. What is the impact of the final rule? “EPA estimates that there are approximately 204 SSI units operating in the United States. The Agency expects that 155 of these units are currently meeting the emissions limits. Forty will need to install one or more air pollution control device. In the next five years, EPA estimates that there could be two new SSI unit constructed.” EPA predicts a lower total cost for compliance in comparison to what was stated in the proposed rule. "The final rule also clarifies that sewage sludge that is not burned in a SSI located at a wastewater treatment facility designed to treat domestic sewage sludge is subject to other section 129 standards, such as the CISWI standards (40 CFR part 60, subparts CCCC and DDDD of this part), the OSWI standards (40 CFR part 60, subparts EEEE and FFFF), the MWC standards (40 CFR part 60, subparts Ea, Eb, Cb, AAAA, and BBBB of this part) or the Hazardous Waste Combustor rule (40 CFR part 63 subpart EEE)." The final rule preamble notes that “these final standards require all new and existing SSI units to demonstrate initial and annual compliance with the emission limits using EPA-approved emission test methods. The final standards also provide an option for less frequent testing if sources demonstrate that their emissions of regulated pollutants are below thresholds of the emission limits.” In addition, SSI units will have to meet new record-keeping requirements and operator training and qualification requirements and submit monitoring plans for bag leak detection systems (if applicable) and ash handling systems. And, in addition to meeting the new MACT standards, new and existing SSIs are required to obtain Clean Air Act Title V permits. Implementation of the new MACT standards rule will involve submission by states of plans for state regulations that are at least as protective as the new EPA rule. States have one year to submit their plans to EPA. SSIs will have to be in compliance with their state’s plan “as expeditiously as practicable after approval of the state plan, but no later than 3 years from the date of approval of a state plan or 5 years after the promulgation” of this new rule by EPA. If a state does not provide a plan, then compliance must occur within 5 years of the promulgation of the new rule. As part of the rule, EPA is promising a system for electronic submittal of compliance data. The NEBRA office has additional information, references, and referrals.